I had to jump through some hoops to get Connectify to work on my corporate laptop because I didn't have full administrator rights but there were workarounds (in my case, installing the software with help from the IT department). The second method which I haven't tried, but many folks have had success with, is to use the Huawei E5830 mi-fi router. This Huawei mi-fi router works like a mobile wi-fi access point and since it runs on its own rechargeable battery, allows for true portability. 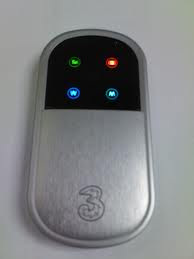 It is small enough to sit in your shirt pocket and allow several wi-fi devices to share one mobile broadband connection. It's something that I've been meaning to purchase but I'm still waiting for prices to drop further. It's currently priced at about S$160 (~US$130) and it would be fantastic for me since I have an unlimited free data plan for my mobile broadband usb stick that should be usable if I transfer the simcard to the mi-fi router.